Moving a step ahead towards eliminating addiction of drugs from the state of Punjab, the Bodh Team at Jalandhar Centre of the organization reached the area of Pratap Bagh in Jalandhar itself in order for educating the masses there about the “Silent Terrorism” of Drug Abuse along with the effective solution to fight it back. 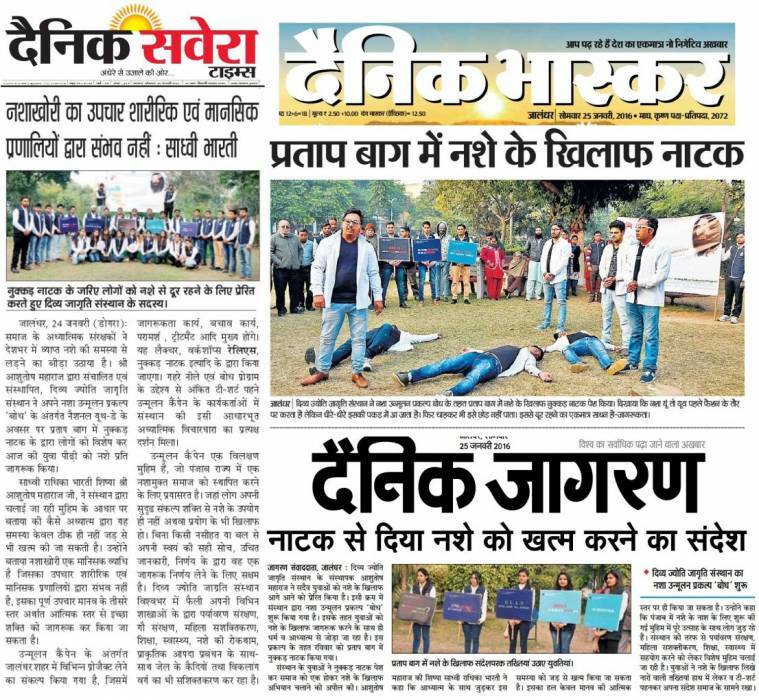 For which, the volunteers initiated the series of this drive with the presentation of an innovative street play enacting upon the journey of an addict, beginning from his first intake of narcotics leading to his abuse. The people on the other hand could well connect with the plight depicted in the skit as they have been witnessing this scenario for past many years and are now yearning for a solution to such a deep rooted problem of the entire state. And as an answer to this, the facilitator of Bodh, Sadhvi, disciple of His Holiness Ashutosh Maharaj ji, founder/mentor of Divya Jyoti Jagrati Sansthan delivered an insightful speech on “How Dhyan-Therapy serves as an effective solution to this engraving problem of drugs”. She explained to the audience how self-awakening alone strengthens an individual at all levels of one's existence thereby, enabling him to break free from the clutches of drug abuse. Hence, Dhyan –therapy has an edge over all other treatments that are available in the market. Towards the end, the Volunteers conducted a short quiz with the onlookers of the session on Swami Vivekananda- The epitome of Youthfulness so that they could reflect within, reiterate his teachings and become Ideal youths of the country- as that of Swami ji. Punjab, such a state which once flourished with agricultural prosperity, is now known worldwide as hub of Drug Abuse in India. Therefore to return back the state its lost glory and to protect its younger generation from falling into the hands of drug abuse, in the 3rd quarter of the previous year, a campaign against drug addiction named “Unmoolan” was launched under the banner of Bodh- the drug abuse Eradication Program of Divya Jyoti Jagrati Sansthan in Punjab. Post its launch, a series of training workshops were organized for the youth population of the state to train them on the subject of drug abuse so that they can be the torch bearers of the campaign and take the message forward. These selfless and dedicated volunteers of Bodh are now ready and have geared themselves up to sensitize the people of Punjab on Drug Abuse so that it can be completely eradicated from the land. Several people were also counselled individually on how to deal with addicts and the various problems they face due to them. The people well received the program and were determined to spread the message across the nation.